MARTIN COUNTY, Fla. — President Trump’s visit to the Herbert Hoover Dike Friday gave a sense of hope to some business owners on the Treasure Coast, wanting to see if he will, as a result, increase his support in protecting local waterways. “Finally, maybe someone will do something,” said Steven Bologna, owner of Native Fishing Charters. Bologna says the inundation of fresh water from Lake Okeechobee into the St. Lucie River threatens his business. “It pushes all the fish away for the most part. Pushes the bait away. The habitat destruction of the seagrass has been tremendous. We’ve lost thousands of acres of seagrass all the way up to Fort Pierce because of it,” Bologna said. The visit is also a long time coming for Mary Radabaugh, the manager at Central Marine. The business often becomes a ground zero for the worst of the algae. "We are in desperate need of help. Our water supply, our food chain, our economy, our health, everything is at risk at this point. So, it is very important that we have these people come and see and understand the whole picture of what’s going on,” Radabaugh said. She fears the risks are still high for another bloom this summer, as water currently being released from Lake Okeechobee into the St. Lucie River is carrying nutrients. “If the temperatures get hot, the water gets warm, we will absolutely be in the position to have another algae bloom and I don’t believe our community for health, economy and every other reason in the world would be able to sustain this much longer,” Radabaugh said. 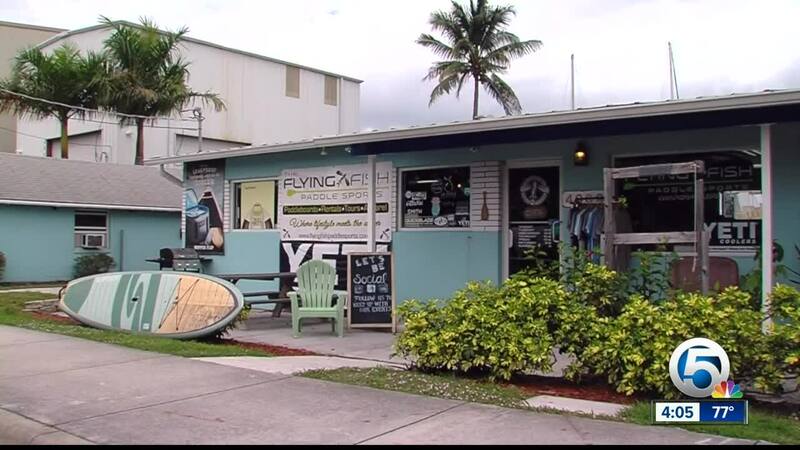 Danny Robitaille owns Flying Fish Paddle Sports in Port Salerno and is currently preparing for one of his largest events of the year. At least 100 people are expected to come to the area to race paddle boards. Right now, they will enjoy clean water. But, in the summer months, Robitaille says there is a lot of uncertainty. Robitaille says he has long wanted to see more support on the federal level. He is hopeful about the opportunity for President Trump to gain a better understanding of how decisions made at the lake impact people around the region.